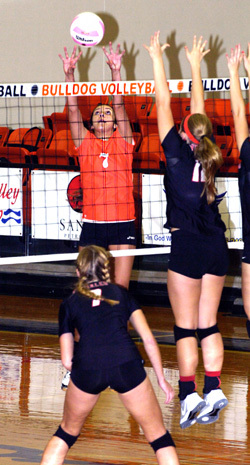 The Bulldog volleyball team knew from experience the scrappiness of Class 4A Portales. And while Artesia was able to post a 3-0 win over the Rams Sept. 17 in their home gym, they knew the girls in red would be giving nothing away Tuesday at Bulldog Pit. After nabbing an opening win, 25-20, however, the ‘Dogs saw mistakes take their toll in Game Two, and the Rams took full advantage, charging to a 25-14 victory to even the match. Portales put themselves in position to end the evening in four with a 25-22 win in Game Three, but Artesia battled back in the fourth set, keeping their composure through the tense final moments of the bout to force a fifth game, 25-23. There, the ‘Dogs got the early upper hand, usually a good indicator of the outcome in the first-to-15 situation. But the Rams rallied in the latter stages to take the game, 15-13, and the match, 3-2. “I thought we were real competitive, other than in that second game, where we kind of just flopped,” Artesia head coach Alan Williams said today. “The girls had a lot of energy and really did well. It was just disappointing losing in the fifth. After we got quite a lead, I thought we could finish it off. It just didn’t work out for us. Libero Kayla Ledezma had 43 digs on the night for Artesia, and Mattie McCombs and Stacia Martinez 14 and nine kills respectively. Williams feels the tough match will serve his athletes well as they prepare to open their District 4-AAAAA slate Tuesday at home against Goddard.